The Minerva Inn on the corner of Paddock Lane and Union Street, c.1930. In an earlier post I mentioned a project of mine a few years ago was to illustrate some of the old pubs of Walsall that are now long gone. This post features the Minerva Inn that was situated on the corner of Paddock Lane and Union Street. This watercolour painting was based on a black and white photograph taken around the 1930s. 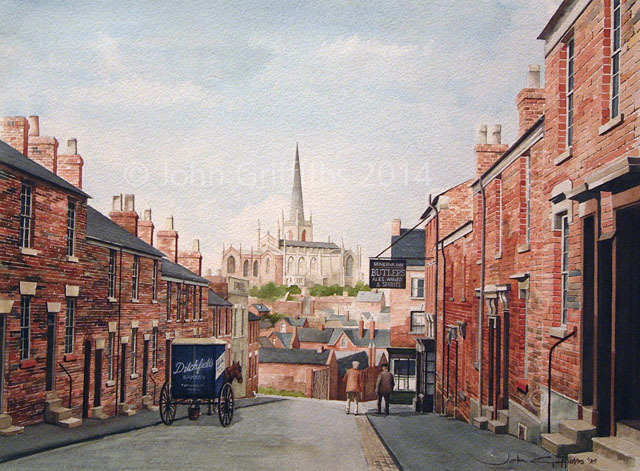 I always liked the photograph for the way the perspective of the narrow street pulls the eye onto the Parish Church of our town, St. Matthews standing proudly on the hill. The Minerva Inn had been around for approximately eighty years when the photograph the painting is based on was taken, the 1851 Census has George Smith as the proprietor and presumably licensee. By 1880 the licensee is listed as William Shelton, followed by James Fox, Ann Fox and then William Fox (23rd February 1900) presumably this trio were father, mother and son. On the 13th December 1911 Albert Edward Wood moved from the Swan in High Street, Bloxwich to become the licensee at a tenancy of £13 per quarter. Eleven years later John Thomas Alcock held the license, taking over on the 11th October 1922. In March 1926 John Rogers was licensee after it became a William Butler’s house. A survey taken in 1925 describes the Minerva as “an old property in good repair with a Bar, Tap and Smoke rooms and seven bedrooms”. In 1937 the tenant was paying £2 5s 0d per week and the average annual trade was 282 barrels with wines and spirit sales of £293. The Minerva continued trading until April 1958 when the license was transferred to the Lamp Tavern in Bloxwich. In the painting is a delivery van pulled by an ‘oss from the renowned, and much missed, Ditchfield’s Bakery of Ablewell Street, almost just a stones throw from the steps of the Minerva; down Paddock Lane left onto Ablewell Street and Ditchfields was a bit further up on the right. 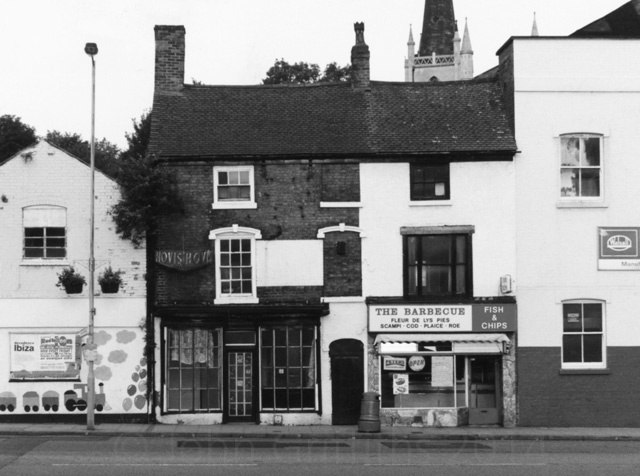 The empty premises once occupied by Ditchfield’s Bakery, complete with Hovis signs on this picture taken in 1998. 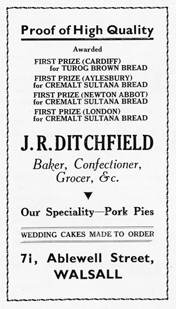 An advertisement for the bakery from the 1960s. Details of the Minerva Inn taken from the excellent book, Walsall Pubs – A History by the late John Cockayne. You are currently reading Minerva Inn, Paddock Lane at Walsall Life.